The Buddhist Council of New South Wales offers this event listing as a community service. Listing of events should not be interpreted as an endorsement of the event or the organiser. Please take appropriate care when choosing to attend or participate in an event. Tonight Sue Butler will present the third of a series of talks using Bhikkhu Analayo’s audio guided Satipatthāna Meditations. This evening’s talk – Death – will be followed by a practise session and discussion. A silent group meditation session is held every Monday night (except for public holidays). Ajahn Dtun is considered to be one of the greatest living meditation masters in Thailand. Renowned for his gentle demeanour and deep wisdom, Ajahn Dtun has always had a reputation as an impeccable and well-practised monk in the Ajahn Chah Tradition. Even as a junior monk, there was a buzz among the monks regarding Ajahn Dtun due to his dedication to practise and an aura of calm and clarity around him.This is a rare opportunity to hear teaching from one of the great meditation masters who has come from Thailand for a short visit. Students will learn the meaning and practice of drawing and painting traditional Buddhist art in the Tibetan style, beginning with the face of the Buddha and progressing through to completion of a thangka for those who wish to participate on an ongoing basis. Guidance is also offered in these sessions to those who have one work or more in progress. A list of art materials required will be provided upon registration. Paul provides participants teaching and instruction every second week. Students are encouraged to attend and self direct on the alternate weeks. This half-hour introductory program for primary school aged children (5-12 yrs old) will include a simple meditation, with time for reflection and discussion. Jackie and Lesta have been leading dharma classes and meditation in primary schools for many years and are regular students at VI. Cost: By donation. No need to register for this class. 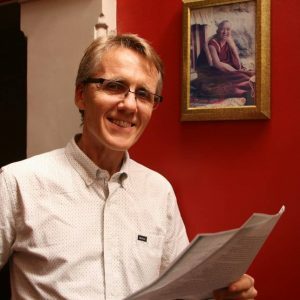 Alan Marsh has been a student of Lama Zopa Rinpoche and member of Vajrayana Institute since it began in the early 1980’s, under the directorship of Ven. Roger Kunsang. During his long association with VI, he’s occupied various positions on the management committee, and was a member of the board of FPMTA for several years. Alan also established and has maintained the garden at Ashfield after VI moved from Newtown, with the help of several kind volunteers. While new students are still welcome to join the course, they should obtain the text (see below) and attend this session to be ready to join the continuing course from 8 May. Registration: Not needed. All welcome. Whether we are religious or not, we all want to make the most of our life and not be caught wasting time on distractions. Discover how to make every moment of the day more meaningful and how to transform our mundane activities into the path to lasting happiness. This Weekly Mindfulness Meditation Group Practice allows you to practice meditation with others, as well as the possibility of establishing and strengthening your own meditation practice. For those of you who have done Insight Meditation, Absolute Beginners Meditation, or Mindfulness Meditation at the Buddhist Library, this class is an excellent way to continue and build on the skills you have learnt. Each month we will invite a guest teacher to facilitate the meditation practice. If the teacher is not present, we will play guided meditation recordings and sit together. Come once; come weekly to this informal gathering of meditation. We offer guided drop-in meditation sessions each week, there is no need to book – just show up! These sessions are by donation. For a Buddhist’s practice to be complete, they must have a means of reorienting themselves towards the guiding teachings in their life. 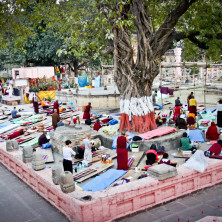 In addition to allowing one to give voice to one’s faith, the act of chanting can help one internalise the teachings and prepare the mind for meditation. 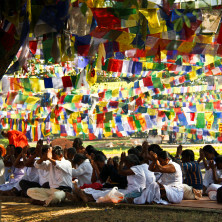 Come together with other Sydney Buddhists to learn the ancient art of chanting. 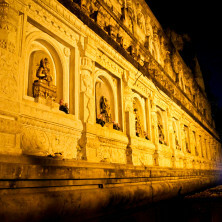 Chanting in a group is the best way to learn the ancient chanting of Pali, the language used at the time of the Buddha. Being in a group also helps you be devoted to your regular chanting practice. New weekly event! Ashtanga Yoga is an ancient practice that develops strength and flexibility in body and mind. The fundamentals of Ashtanga Yoga will be taught in these classes with instructions tailored for the class. The classes are small and therefore direct coaching will be provided to assist participants learn this art. Once th efundamentals are taught, we will move into classes for beginners and advanced practitioners. Marcus Nand has been practicing yoga for over 6 years. He teaches Ashtanga Yoga for the community. His sessions include Asanas and Pranayama practices. You may bring your own yoga mats or use the mats at our centre. Please do not eat two hours prior to the class. This is a drop in class. Check our website or Facebook page prior to the class for any updates. In this class, Geshe la will focus on the famous wisdom chapter (chapter 9) of Shantideva’s classic text ”Engaging in the Bodhisattva Deeds” on Bodhicitta and the six perfections. This chapter is a detailed and profound exposition on emptiness, ultimate reality according to Buddhism. The dialogue takes place between the Madhyamaka school, represented by the author Shantideva, and various other Buddhist and non‐Buddhist schools. This is an advanced level course on Buddhist philosophy. Audio recordings of Basic Program subjects taught by Geshe Samten are available on the VI website on our Resources page. This series of teachings is based on “Seven Points for Training the Mind” by the 12th century Tibetan Buddhist master, Geshe Chekawa. Mind-training is not a system of beliefs, but a set of practices for training our hearts and minds to embrace the world in more caring and understanding ways. It examines how we normally view and relate to life’s many challenges and offers alternative perspectives from which we might more skillfully respond. The hallmark of the practice of mind-training is to be able to transform everyday problems into opportunities for growth. These classes consist of talks, meditations and discussions in an open and relaxed atmosphere. Everyone is welcome. NOTE: This weekly class is held at Collaroy Swim Club (in the rear), Pittwater Road, Collaroy. ‘Qi’ roughly translates to ‘Vital energies’ and ‘Gong’ to ‘Cultivation’ and is more simply described as a Chinese style of gentle yoga. Medical Qigong is one of the 5 types of Chinese medicine and is over 2000 years old. In this morning class, we will be learning a series of transformative healing movements to nourish your body, calm your mind and energise your spirit! Yoga works with the body and the breath to still the mind. Through regular practice, achieve a sense of lightness and ease in the body and clarity and stillness of mind. At VI, we teach an integrated style of classical yoga incorporating breath, movement and meditation. Classes are suitable for all ages and abilities. Mats provided. I’m a believer in the restorative power of yoga. In my own case, after several years of sitting cross-legged on the floor at teachings and meditation retreats, I had constant pain in the hips. A chiropractor suggested a referral for a hip replacement or that I take up yoga. I took up yoga! That was over 15 years ago and I have been pain-free ever since. When my long-term teacher retired three years ago, I knew it was time for me to teach others what he had taught me so I completed the teacher training programme at The Yoga Institute. I now bring classical hatha yoga training with a Buddhist slant to classes in VI’s beautiful meditation hall.